I am encouraging you to take heart! Currently, Mr. Alldred is now resting. But, in the very near future, he will be raised---resurrected---to the prospect of living here, on earth—FOREVER! This is a PROMISE from our Creator, HIMSELF! Isn’t that wonderful, good news? I hope these words of encouragement have done for you what I have intended for them to do. And, that is, to provide you with some comfort, peace, and strength. Condolence: I enjoyed my time with Dennis in pulmonary rehab. In that time I found Dennis to be selfless, kind and generous. Dennis was also likely the hardest worker I have had in trying to combat the effects of pulmonary fibrosis. He worked hard enough to put 20 year olds to shame. I am better for having know him and will miss him. Thanks to God and the Alldred family for sharing him with us. There are no words that can be said during times like this, that will ease the pain and sorrow. I pray that the Lord God give you comfort, peace and assurance that one day we will see our loved one's again, and as memories flood your mind and soul they bring joy and a smile. Condolence: Coach Alldred was such an amazing man. In all that he did, he showed strength, positivity, love, and passion. My heart is broken at the thought of the world no longer being graced by his presence. He taught me and so many others so much and we will forever be grateful. As much as it pains me I can not even fathom what you must be going through. Your family will be in my thoughts in prayers. Rest in Peace Wildcat. Condolence: Dennis was a great example for young people. He was also a great teacher. 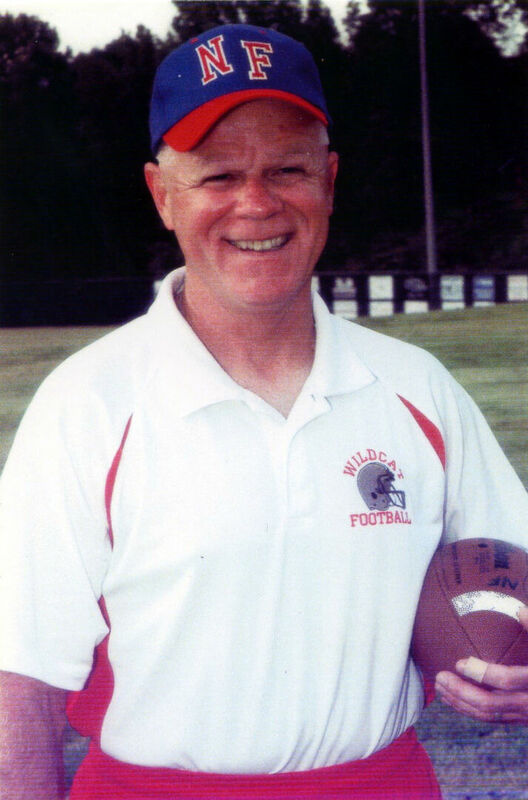 My heart hurts to have lost such a great friend, co-worker, great teacher and coach, and just an all-around great man. Some of the best memories of my years at North will always include Dennis and what a great tradition he built at North with the football program as well as having taught with him for the years we worked together. He was a great role model for not only the kids he coached and taught but also for the professionalism he always showed. I always looked forward to the e-mail jokes and quips he would share with me after I retired. Inasmuch as he will be missed by all of us, we cannot even fathom the loss you must be feeling. Dennis often spoke of all the things that you did as a family and all the experiences he had with the two of you. He was a family man above all else. You two were his world and the love of his life and I am sure that he was yours. There are no words that can be spoken to fill the emptiness or take away the loneliness that you must be feeling. Just know that we all are better for having known this wonderful man. I'm sure that Dennis has found his place in Heaven and we will one day share that beauty with him. Condolence: Wishing you peace to bring comfort, the courage to face the days ahead, and loving memories to forever hold in your heart. Know that you are in my thoughts and prayers during this difficult time. Love you!